We routinely offer commercial services for fabric awnings, extruded aluminum canopy design and installation, standing seam metal awnings, sunshade systems, insulated and non-insulated metal wall panels and most any other custom covering that you need. If your question about any of these products is not answered in the items below, please contact us and we’ll be happy to assist you. Q. 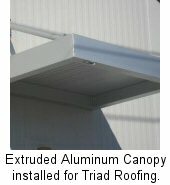 How is an aluminum canopy different than steel? A. Based on design, both canopies are similar. However, aluminum spans have engineering limitations. Q. Can canopies and awnings be engineered? A. Yes, all of our projects can be engineered by our Structural PE, who is licensed in many states. Read more about our custom fabrication process. Q. What is an ideal location for canopies? A. Our canopies are ideal for window shades and protectors, walkways, and other shelter protection. Q. Can we get different colors on canopies and awnings? A. Yes, we offer a wide variety of standard colors but also custom powder-coating from our local supplier. View product descriptions. Q. Will you help us with design? A. Yes, our goal is to work together to find the right solution to your canopy or awning requirements. A. Yes, most of our installations are custom projects. Q. I know fabric awnings provide shade but what about protection from the rain? A. Yes, we offer weatherproof fabric for awnings by request. Q. Do you offer anything else besides awnings and canopies? A. Yes, we offer installation on all types of protective covers; this includes metal wall panels, standing seam material, trellis systems, gas canopies, and custom bus shelters.